Home » Auntie Lulu's Cucku's Nest » Velvety Rose Embossed Wine Long Evening Gown SM. 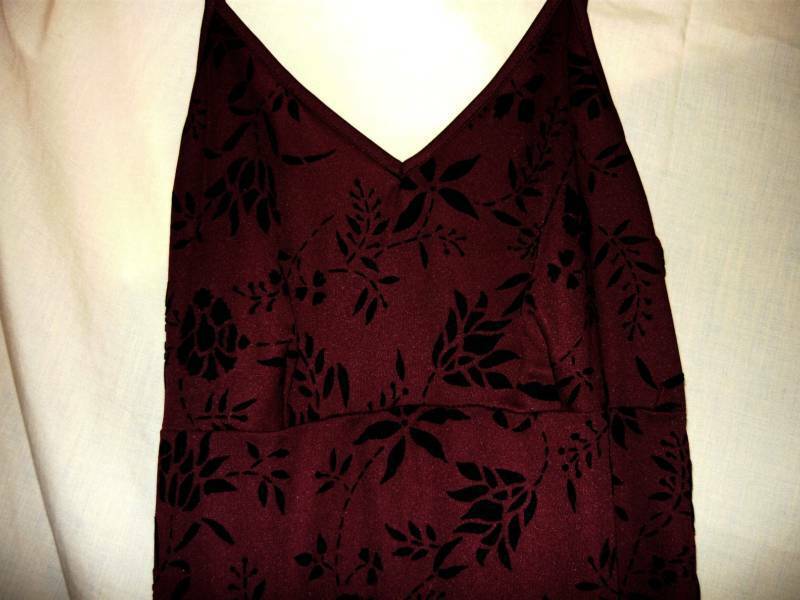 Simple long gown in a stretchy knit w/ embossed black velvety roses ON A BURGUNDY BACKGROUND. LIKE NEW. Cool for cocktail party, dinner date(not McDonald's) or clubbing. Add a big silver metalic belt for a totally punk look. Turn it into your own Goth or etc. look with long black fringe or............... Bust-32", Underarm to floor-49" I will be selling off various mixed merchandise from my closed consignment shop. All is in excellent condition unless stated otherwise. I describe items to the best of my ability, so please consider complete listing and MEASUREMENTS to save conflict later. We both want a fair and pleasant transaction now and in the future. Please ask if there is any confusion about the listing and I will do my best to answer in a timely manner. Here's hoping for a long and pleasant relationship with you. I want to become your little shop down the block. Drop by and find something cute for yourself. I'll put the tea pot on. Sincerely, Lulu :) Please enjoy your shopping experience.